Worrying developments in DRC’s North Kivu have been recently reported. Besides heavy fighting and the region’s struggle with masses of displaced people, a cholera outbreak has claimed at least nine lives in refugee camps. In the 1990s, the region experienced devastating health and sanitary conditions which left thousands of local residents as well as refugees dead. In the aftermath of the Rwandan genocide and later fighting in the DRC, tens of thousands of people faced bad sanitation facilities and a lack in health care. The resulting cholera outbreak was one of the worst ever reported claiming thousands of lives. In the course of the fighting in the North Kivu region between M23 rebels and FARDC soldiers, approximately 450.000 people have been displaced. 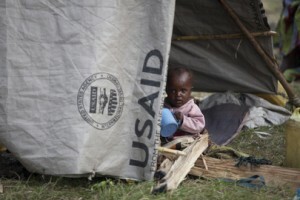 Huge refugee camps have been set up and as in the 1990s, health workers in the region report a lack of appropriate health care and sanitation facilities. People have been setting up makeshift shelters at short notice in order to seek refuge. In many cases, sanitation facilities and clean water are missing. The WHO already reported an increase in cholera cases in the region about two weeks ago. According to the WHO’s Global Alert and Response (GAR), 368 new cases were reported from epidemiological week 24 (11-17 June) to epidemiological week 26 (25 June-1 July). Areas of concern are Birambizo, Goma, Karisimbi, Kiroshe, Mutwanga, Mweso and Rwanguba. Now nine infected people have died of cholera. Health workers in North Kivu fear that the ongoing period of warfare will affect the humanitarian situation to a high extend. They are particularly concerned about access to health care and clean water. If proper sanitation facilities cannot be provided it is to be feared that cholera will spread increasingly. 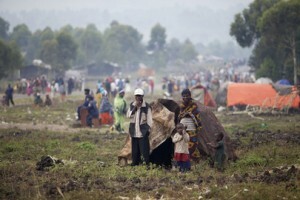 If that happens, more cholera related deaths will strike the refugee camps in the North Kivu region.